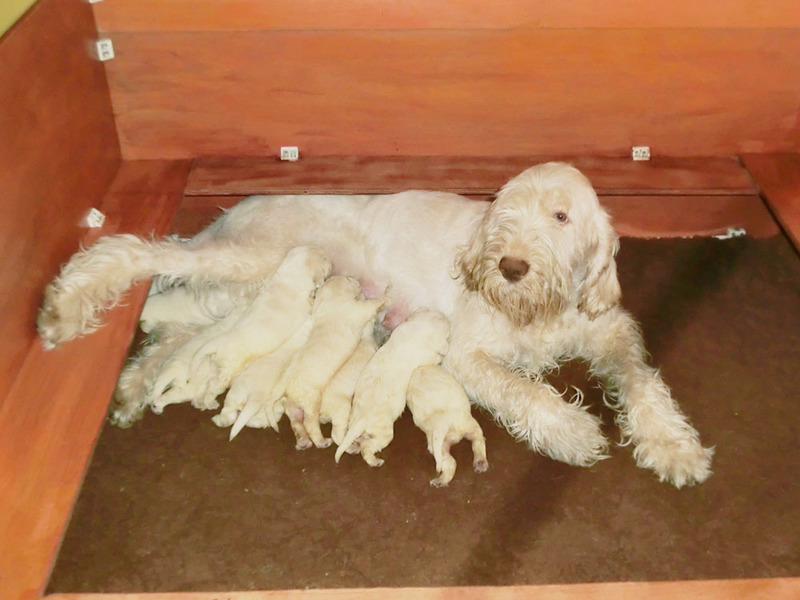 Back in January 2015, we published an article about ace Italian Spinone breeder and judge Nina Fleming’s latest litter. You can find the original article here. Well, Nina’s dogs have come up trumps yet again and she very kindly attributes some of her success, and the health of the mother and pups, to the role of Gilbertson & Page foods. If you’ve not heard of Nina, she is one of the leading authorities on the Italian Spinone breed, having judged internationally. She’s also the Spinone Breed Correspondent for Dog World magazine. This litter produced 9 puppies on March 23rd, of which have 8 survived and thrived, developing into very strong and healthy pups very quickly. As Nina has a particular approach to feeding both the mother and puppies, we thought you’d be interested to know how she achieves such outstanding results. While the mother, Riva, was in whelp, Nina mixed Dr John Puppy dog food with Dr John Hypoallergenic Lamb & Rice. This was a trick that she’d used very successfully on the last litter. Her approach is based on trying to provide high quality nourishment to keep the mother healthy whilst also providing an additional element of minerals and calcium to support the developing puppies. It’s undeniable that Nina has a knack of delivering litters that quickly develop into strong-boned and active puppies. Because the post-natal health of the mother is equally important, Nina has kept Riva on Dr John Puppy for a few weeks and reports that Riva is producing plenty of milk for her large litter and has regained the strength necessary to look after her puppies. If you’d like to know more about our foods and how they can help you to achieve the results that have so impressed Nina Fleming, please get in touch. (We’d like to point out that Nina stays in touch with us because of her regard for our foods and she is not part of any breeder programme (we don’t have one!) or sponsored relationship with Gilbertson & Page. However, we’re very grateful for the valuable feedback she provides).